Recently I heard Sue Rose reading, and had a sense of recognition and that I shared some of her preoccupations. I love the way poetry gives you access to most interesting parts of people’s minds. For me, reading poetry is a way of feeling less alone in the world. I find Sue’s poem exquisite. I love the inherent pathos of the poem’s idea, and the way that it transforms things like wires and pipework into ‘solidified rivers’ deftly allowing us to infer some catastrophe has occurred. Or marvelling at the ivory of a keyboard because it may have absorbed something of the people who lived there. I also love the idea of playing with absence. The lives that are implied by the poem are for us to imagine. Are they just like our own? The poem is asking us to imagine the world without us, still existing, still being observed. Just as we as individuals will all one day be absent from the continuing world. Sue’s new book ‘From The Cost of Keys, published by Cinnamon Press, 2014’ and can be bought here. and floor were, no doubt, pipes for water. whether for measurement or ritual, we can’t be sure. there are image screens in the site museum. with the keys as they yellowed in the falling heat. or front room in some sections of society. it seems they made fires, although quite advanced. odd words still legible—love, bike, harpsichord. 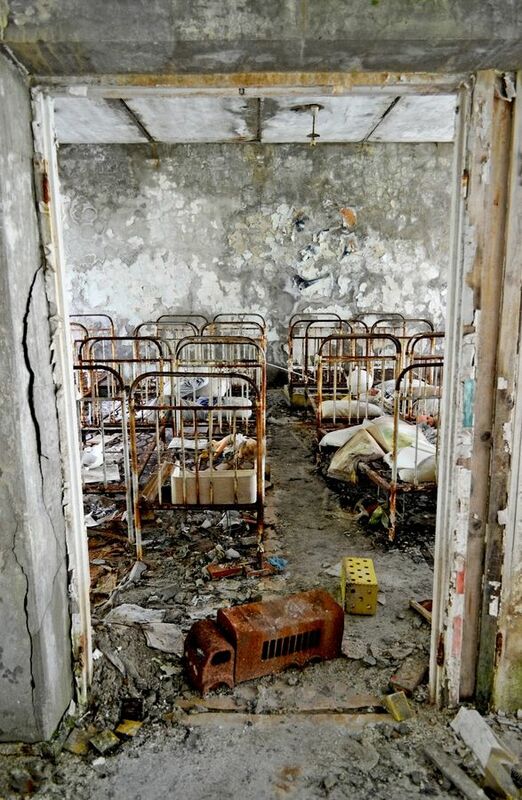 This poem reminds me of images from Pripyat, a town abandoned after the Chernobyl meltdown. Here is one of those. This entry was posted in Poetry and tagged An Adumbration of the Light Age, Guided Tour, Pripyat, Sue Rose. Bookmark the permalink.